High adventure awaits those courageous enough to join this misfit crew as they sail the mysterious 20 seas surrounding the alien world of Mer. Led by the young prince Ren, these unlikely heroes follow an enchanted compass through dangers beyond their wildest fears, seeking the 13 Treasures of Rule, which will release the troubled planet from the deadly dark waters devouring its surface. As if the fate of the world wasn’t enough, Ren must also defeat the evil pirate Lord Bloth, who follows Ren’s sails intent to steal the treasures he uncovers. For swashbuckling action, you’ll find that a pirate’s life is for you: grab the seagoing bounty of the 4-Disc, 21-Episode The Pirates of Dark Water Complete Series Collection! This animated series in an oddity, since in many ways it appears to reflect a medium in flux. The series ran from 1991 through 1993 on Saturday mornings and was produced by Hanna Barbera and Turner Entertainment. This was before the groundbreaking and beloved work that was done at Warner Animation with Batman: The Animated Series and the Spielberg produced Tiny Toon Adventures and Anamaniacs. 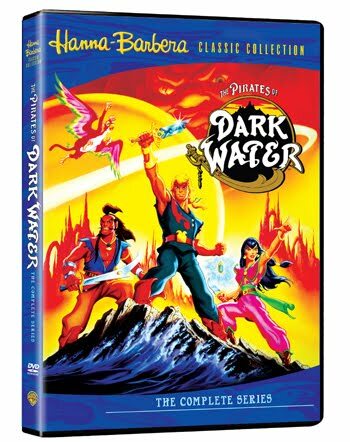 What immediately sets this apart is that unlike previously produced Hanna Barbera cartoons, The Pirates of Dark Water had a singular epic story. Plot threads were continued from episode to episode and the series did not return to status quo at the end of every segment. Yet, at this time, animation was still considered to be for children. The adult animation audience was untapped and the anime audience was still incredibly small in the United States at this point. Certainly ahead of it’s time and if I had been ten years younger when it aired, I most likely would have fallen in love with it. Watching the complete series now, certainly didn’t strike up any feelings of nostalgia. First, it’s garish. Colors are so ridiculously intense, they often distract from the work itself. Seriously? It seems like the animators suddenly had access to every color. And they used them all. The voices were also distracting, in no small part because of the medium at the time. Frank Welker, Peter Cullen and Jim Cummings all provided voicework. These three talented men, known for thousands of voice performances, felt too familiar for a series that was so different and with the additional cast of Jodi Benson, Hector Elizondo, Brock Peters, Tim Curry and George Newburn, I found myself trying to place the voices rather than get lost within the show. 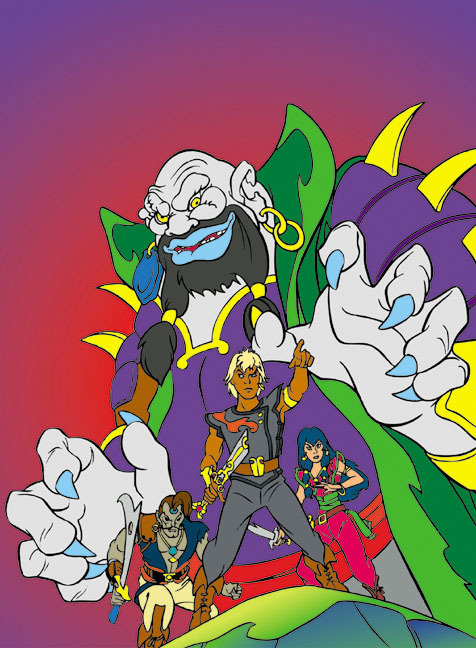 Having not grown up with the show, The Pirates of Dark Water didn’t satisfy any nostalgia one would have with the show and frankly I thought it was unnecessarily busy with far too many one liners and not my taste. That being said, fans of the show will definitely be satisfied with this complete series release and frankly, that’s the target audience, isn’t it? Now, where’s my release of The Herculoids?